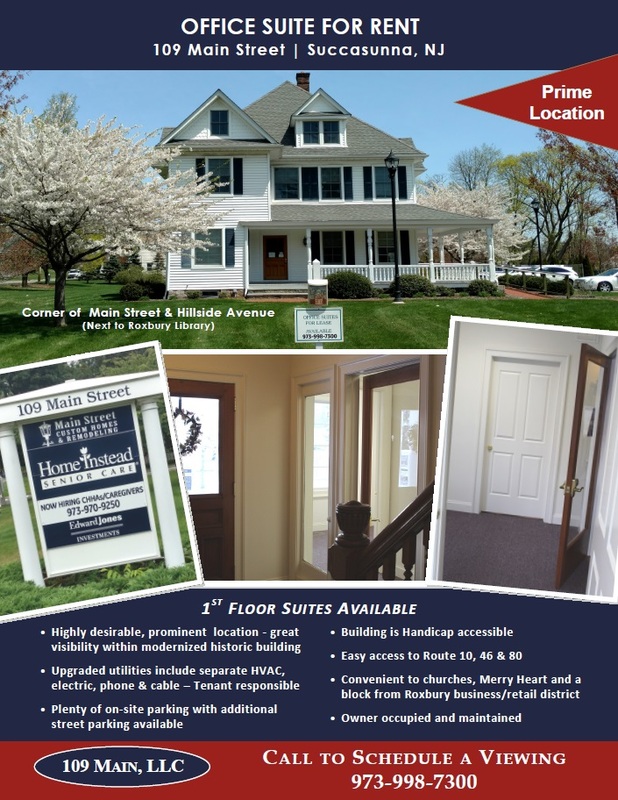 Office Space | Main Street Custom Homes & Remodeling - Residential and Commercial Construction Company serving Morris County NJ and the surrounding northern New Jersey area. Call 973-998-7300 for additional details, availability and rental rates! Click on street sign image on left to view more photos! 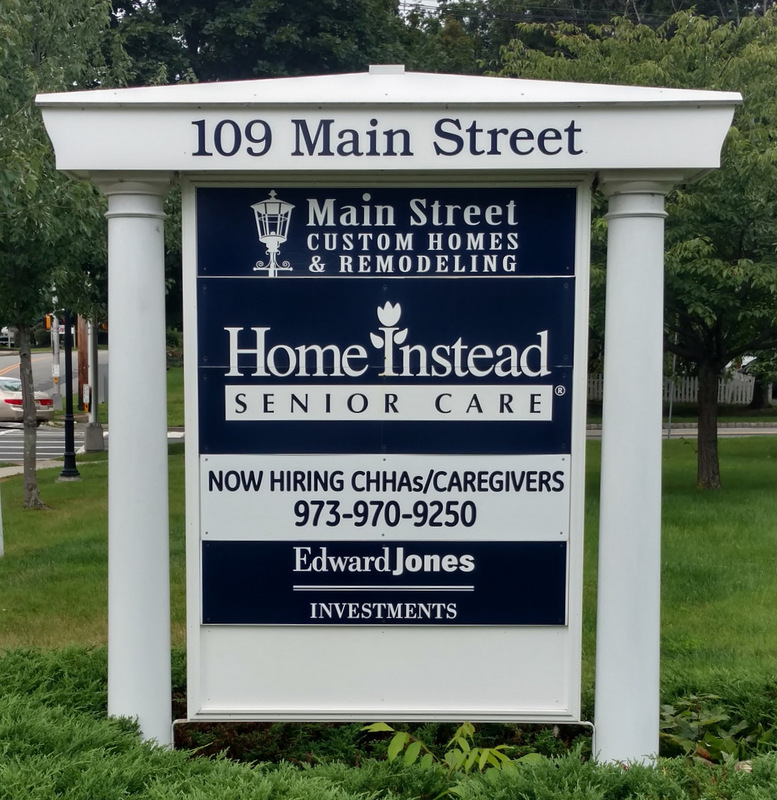 The 109 Main Street building has been a landmark since it was built in the 1900s at the crossroads of Main Street and Hillside Avenue in Succasunna. It was designed and constructed as an office and family residence for the only practicing physician in town at the time. The property also included a carriage house, originally used to house the family horse, carriage and feed. “The building captured our attention because of its prominent, highly visible location and inherent charm. The challenge was to keep the turn-of-the-century design details that give it a unique character and make it viable as a 21st century office space. Inside we tore out most everything except the structural framing. A new open floor plan, coupled with the existing nine foot high ceilings, dramatically changed the interior space,” said Don Dyrness. In 2009, the Roxbury Area Chamber of Commerce (RACC) recognized our efforts with the Beautification Award for the historic renovation of the 109 Main Street office building. Each year the RACC selects a newly renovated or constructed commercial building that stands out from the rest for its integrity of design and quality of construction, as well as its contribution to the overall beauty of the business community. “It was time consuming, painstaking work, but well worth the effort. We’ve created a new office building with all the modern conveniences, and yet have preserved the unique Norman Rockwell-esque ambience. We’re delighted with the results! Every town needs a great Main Street and we see 109 Main Street as a significant part of its return to prominence in Roxbury,” stated Dyrness. The redesigned interior is much more accommodating to the office space needs of today’s professionals. Other upgrades and amenities include handicap access restrooms and entryways, cable connections and fiber optic capability. All new siding, windows and roofing were installed improving the building’s overall energy efficiency. The goal throughout the renovation process was to keep the charm of 109 Main Street intact while creating a modernized office environment. The original porch, front door, main stair rail, first floor fireplace mantel and surround were all restored.